For most people, there is a certain clarity which comes with age. Whether for good or bad, this clarity helps to put past experience into perspective and is the idea behind “with age comes wisdom.” The idea that a person could turn back time to reverse a decision he or she made; to choose another route, is something which is much talked about but is neither practical nor possible. The collective experience of a person’s life is completely unique and is the essence of individuality. The latest production by The Barrow Group, Craig Wright’s The Pavilion, is one which very effectively explores the repercussions of a person’s past decisions and its lasting impact. Though The Pavilion is a play which addresses time as if it were a simultaneous occasion—past, present, and future all occurring at once—the story takes place in the present, at The Class of 1985’s 20 year reunion. Of particular interest, the story focuses on Peter (Dusty Brown) and Kari (Julie Voshell), high school sweethearts who had a storied romance which withered and deteriorated long before the events of the play. 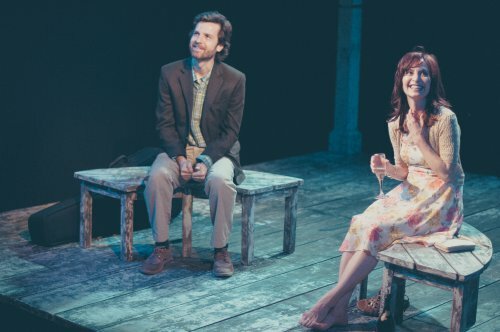 Funny at times and touching at others, Brown and Voshell have created a comfortable on-stage relationship which is buoyed by excellent chemistry, and the different dynamics of the two actors gives way to some moments which are very sweet and others which are heartbreaking. Though the troubled couple is the story which keeps the play grounded, the hands-down standout performance of the evening belongs to Seth Barrish, co-founder and co-artistic director of The Barrow Group. Playing the role of Narrator, Barrish expertly glides between close to ten separate characters who all speak differently, react differently, and have different backstories and relationships to the main characters. Impressively, each character has a very specific physical or vocal trait, and all of the characters are as clear and distinguishable as the next. There are multiple moments where Barrish transitions from one character to another, then back again, in what can’t be more than a span of fifteen crystal clear and perfectly executed seconds. The performance is truly inspired and is, frankly, a testament to Barrish’s skill: this role was written to demand a very technically trained actor, and in his success Barrish provides a master class in acting, demonstrating immense focus, variation and imagination. Directed by the team of Lee Brock and Alyson Schacherer, this play cannot have been an easy task to tackle. 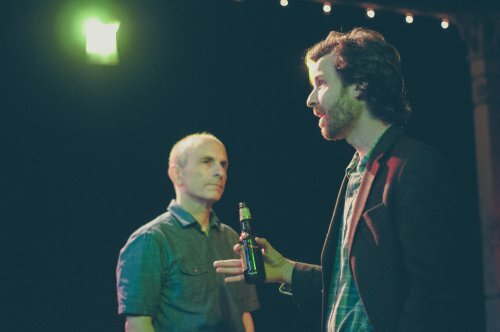 The script is written in a manner which is fluid and simple, but any observer can tell that this is a play which is full of many subtle and nuanced moments. Without proper direction, things could have ended up a wash but instead this is a production which is powerful and impressive in the way the different elements of the production seamlessly blend together. The scenic design by Edward T. Morris perfectly suits the production. The stage portrays an actual pavilion, with distressed wood floorboards and large wooden pylons reaching towards to sky, but the overall impression is that this physical pavilion lives in an ethereal place. The backdrops and walls are done in dark shades of black and blue, and this contrast complements a set which is simple but engaging. With a distinctly mysterious quality, the lighting design by Solomon Weisbard is a blend of different lighting techniques—including the effective use of a scrim to create starlight among other things—which support the set and players, and apply the finishing touches to a fully developed and executed concept. Led by a narrator that provides a powerhouse performance, The Pavilion boasts a cast of very talented actors, meticulous direction, and an enchanting atmosphere which all adds up to a splendid and profound evening of theater. Clubbed Thumb production that ingeniously and hilariously chronicles John Wesley Powell’s 1869 expedition through the Colorado River to the Grand Canyon. A highly entertaining evening broken into seven very different plays; much to be laughed at as there is to be contemplated. Three fascinating musical monologues, in turn, sweetly bizarre, heartwarming and shattering.